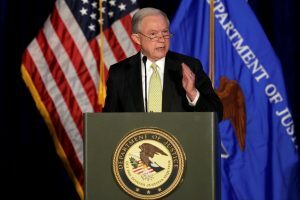 MINNEAPOLIS — The Justice Department will soon make it easier for local law enforcement to seize cash and property from crime suspects and reap the proceeds, Attorney General Jeff Sessions said Monday. Sessions said a shift will be announced this week that will increase the use of asset forfeiture, especially for drug suspects. The practice has been criticized because it allows law enforcement to take possessions — such as cars and money — without indictments or evidence a crime has been committed. “With care and professionalism, we plan to develop policies to increase forfeitures. No criminal should be allowed to keep the proceeds of their crime,” Sessions told local prosecutors in Minnesota. A change in the policy would likely represent another reversal by Sessions of Obama-era Justice Department procedures. His Democratic predecessor Eric Holder had tightened control of the department’s asset forfeiture operations amid concerns that property could be seized without judicial oversight. Holder limited the ability of local law enforcement agencies to turn over seized assets to the federal government and then share in the proceeds. Civil liberties groups praised the move as a step toward reform because that practice made it easier for local authorities to circumvent state laws that were sometimes stricter than the federal ones governing seizures. The line drew a round of applause from the hundreds of county attorneys and law enforcement officials inside a Minneapolis convention center. Local law enforcement agencies use such proceeds to pay for expenses, and some had complained that Holder’s policy left them without a source of critical funding. But that policy was also designed to save federal resources for larger, complex investigations where the ability to seize assets is critical, such as cases involving national money laundering or Russian organized crime, said Stefan Cassella, a former federal prosecutor and expert on asset forfeiture and money laundering law. Left: Attorney General Jeff Sessions delivers remarks at a June summit on crime reduction and public safety in Bethesda, Maryland. Sessions said a shift will be announced this week that will increase the use of asset forfeiture, especially for drug suspects. Photo by REUTERS/Yuri Gripas.